I'm trying to update the blog more often...and keep the posts shorter. :) Here are a couple recent pictures of fun with the kids. This is a terrible picture 'technically' but Isa is smiling and giggling now a LOT. It's SO fun! 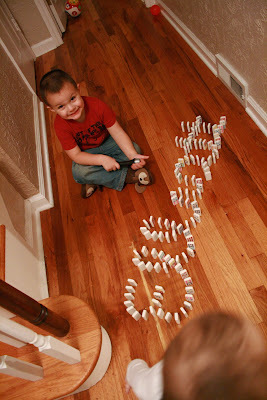 Fun with dominoes. Although, it is really hard to keep the kids patient and interested when it takes so long to set up the dominoes before they can push them over.